Nothing ages more beautifully than marine-grade rope and solid brass hardware. Hand dyed in nature's Rainbow colours and crafted in Brooklyn, NY for adopted animals and their people, this FoundMyAnimal leashe is marine grade rope hand-spliced to withstand hundreds of pounds of pull. The ends are then "whipped" (an old nautical term) for additional durability. Fixed on the ends are solid brass lockable carabiners designed to allow additional safety for our pups big and small. The adjustable solid o-rings along the rope allow the leash to be used many ways (see sketches below). 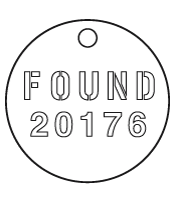 The individually-numbered, stamped tags on each FOUND leash serve as a reminder of the uniqueness of your animal and allow us to keep track of the number of animals you have helped so far. The solid o-rings and clips (marine grade hardware) on our adjustable FOUND leashes allow them to be used many ways. It's easy to move the o-rings. You hold one of the rings still and twist the rope through the ring with your free hand. 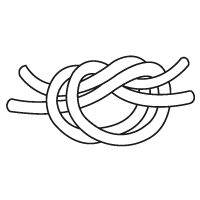 The braids of the rope will separate slightly for the ring to move along. The ring will stay where you leave it. You may clip either end of the leash to your dog's collar.